Looking for a clean salad dressing to make? I got you covered — don’t worry! 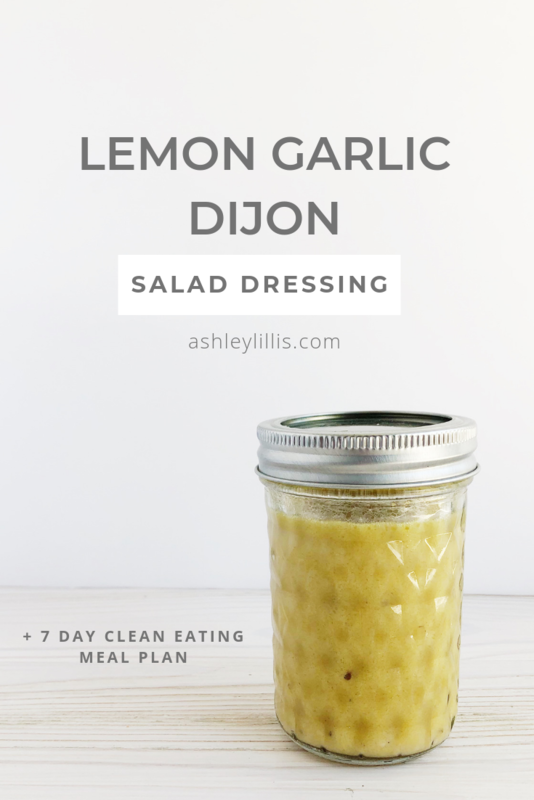 This lemon garlic dijon vinaigrette salad dressing is made with clean and simple ingredients, it’s full of flavor, and goes with so many food options (other than just salads!). You can make it in 5 minutes and keep it in your fridge to enjoy all week and beyond! Have you ever looked on the back of store bought salad dressings? A lot of times, salad dressing labels make us think we’re eating clean and healthy by marketing things as all natural or slapping pretty pictures of fruits and vegetables on the front. However, when you stop and actually look at the ingredients they’re full of preservatives and added sugar. If you can’t pronounce it, you probably shouldn’t be eating it! A long list of ingredients is a sign that the dressing is full of additives…. and you just don’t need those things! Don’t get me wrong, not all store bought salad dressings are bad for you — there are many clean options out there. I’m just encouraging you to try making your own since it’s easy to make something delicious in your own kitchen in a matter of minutes! You’d might not expect this salad dressing to have many health benefits, but it does! Lemons are a great source of vitamin C and have a ton of antioxidants. They contain limonoids, which have been shown to help fight some forms of cancer. Garlic not only packs a punch with its flavor, but it’s full of health benefits. When you mince garlic, allicin is formed. This compound acts as a strong antioxidant and also exhibits antibacterial, antiviral, and anticancer benefits. Apple Cider Vinegar can help lower blood sugar levels. Not only is a powerful antioxidant, helping to detoxify your liver and strengthen the lymphatic system. It also has antibacterial and anticancer properties and is even said to help your body absorb calcium. Olive Oil is a great source of healthy fats and is full of antioxidants and phytonutrients (natural chemicals plants produce to keep them healthy). It also has great anti-inflammatory benefits. Be sure to choose a quality organic extra virgin olive oil for salad dressings to get the most nutrients. Shake all of the ingredients together and enjoy over your salads or other favorite foods like chicken, quinoa, or even a bean salad. Interested in more clean eating recipes? Download my free 7 Day Clean Eating Meal Plan today to help you with meal ideas on your health journey. Clean eating has been a vital part of my weight loss success and I can’t wait to share more with you! Thank you! Please check your inbox to confirm your email address and then we’ll send you another email with a link to download your guide.